Paul Hamburger is co-chair of the Employee Benefits & Executive Compensation Group and head of the Washington, DC office. Paul is also a leader of the Practice Center’s health and welfare subgroup and a member of Proskauer’s Health Care Reform Task Force. Paul provides technical knowledge and advice to employers on all aspects of their employee benefit programs, and advises employee benefit plan trustees and service providers on ERISA and employee benefit plan-related matters. He has extensive experience in negotiating service provider and outsourcing agreements. Paul frequently represents clients before government regulatory agencies, including the Internal Revenue Service, Department of Labor and Pension Benefit Guaranty Corporation. Recognized by a number of publications for his exceptional work, Paul is described by The Legal 500 United States as "one of the best in his field; he inspires a high level of confidence and is a pleasure to work with." Chambers USA notes that Paul’s clients refer to him as "a creative, business-oriented and brilliant lawyer who educates and enlightens." 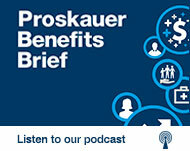 As a noted thought leader in his field, Paul frequently speaks on employee benefit matters. In addition, he served for several years as an adjunct professor at Georgetown University Law Center teaching the LL.M. tax course on ERISA Health and Welfare Benefit Plans. An author of numerous articles on employee benefits matters, Paul has produced a number of nationally-circulated loose leaf publications, published by Thompson Information Services: Mandated Health Benefits – The COBRA Guide, The Guide to Assigning & Loaning Benefit Plan Money, and The Pension Plan Fix-It Handbook. Most recently, he was the managing author of the 6th edition of The New Health Care Reform Law – What Employers Need to Know (A Q&A Guide), published by Thompson HR.